My name is Tony Turbee; I am a veteran and frequent the YMCA, in Oneida, New York. I overheard Judy Toner talking about the work she and her NY Help colleagues have been doing and plans for an upcoming trip. I inquired about the mission and asked Judy for information regarding NY Help. Judy sent me the requested information. That night I booked passage to San Pedro Sula, on Judy’s flight. This fit the bill…A Mission.. The journey was a radical departure from my daily routine. There was the logistics: packing, purchase of supplies/clothing to contend with, their environment, immunizations, Language, new cultural experiences and of course meeting new people. We arrived at San Pedro Sula, a very busy airport and grouped together and exchanged currency. Then to move 18 duffel bags being stowed, in a van accompanied by 8 people. The thought of maximum axle stayed with me, as the rear end showed effects of the weight. Off we went. What amazed me about this trip from the very beginning is the logistical orchestration that unfolded among seemingly chaotic situations and the level of Calm our translator constantly displayed during what appeared to me to be a very ambiguous situations. This group is connected. Our contacts were on point when needed. The ride into the mountains was a first. A small Toyota pickup (4 wheel drive) hauled 3 of us along with all our personal bags up a mountainous dirt/mud road that seemed to continuously ascend. The water filled ruts made me appreciate 4 wheel drive despite the thought of a chiropractor. Very bumpy in the bed of the truck. We arrived at La Laguna’s sleeping /pharmacy/eating quarters building. This is the only building among the 12 villages that has electricity for an outside light, which is produced by a Solar Panel structure installed and donated by a French Engineering firm, as I recall being told. The dwellings were very simple, by western standards, yet suitable for our purposes. Our quarters were a small room for two, with a bed which required an air mattress for reasonable sleeping comfort. Luminosity provided by flashlight as it was very dark when the sun set. No street lights or city lights. The kitchen was simple. Cooking meals (rice and beans), sometimes pancakes was done on a stove built with local materials. The heat source was wood. 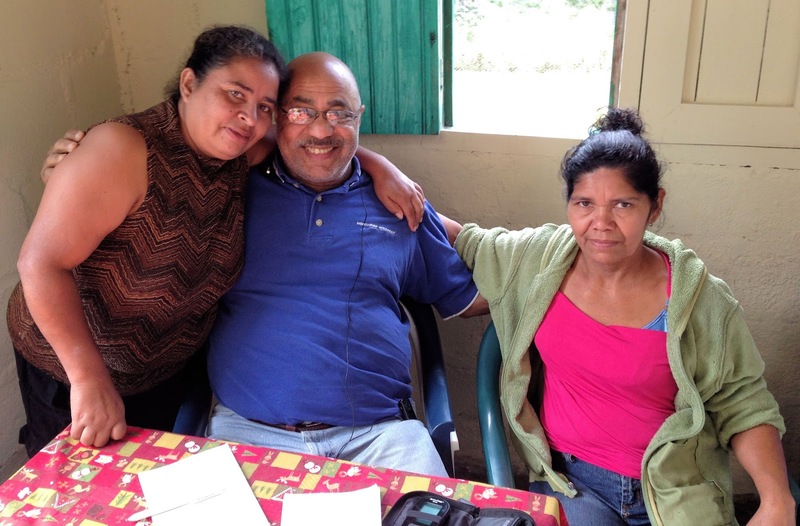 I am privileged to have befriended Ruth Garcia (Aracely) and Odina Dominguez who prepared our meals and assured our well being. They are so congenial. This was the cultural/linguistic immersion not to be found in my area. The people were simple, polite and welcoming. The children were children. They actually played, energetically. The only visible playground was a pasture, that was a Soccer Field when not occupied by cows, horses and goats, to graze. No resources are wasted. Everything is used until useful life is expended. We are at an altitude of 4,081 feet, miles from highway and roads. 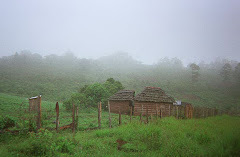 There are no stores, TV’s, power lines, radios, cell towers or any other phones, Internet, or lights. By day three it really occurred to me that I am off the grid…incommunicado. The absence of our modern day technology was most welcoming. 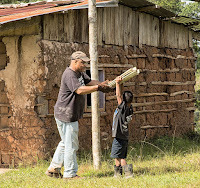 We divided the work and began two tasks, in La Laguna..Remove roofing material off the school and replacing with corrugated-like metal sheets commonly used throughout the country. The assistance of three young boys, whom I enlisted to help, accelerated that effort. Everyone likes to feel included and the offering of gummy bears that I brought, sealed the deal, so to speak. The only delay was awaiting the arrival of the truck with roofing material and supplies, purchased in the town of Yoro. Upon completion we had lunch and proceed to the next project at the Clinic building where we ate. I scraped the cinder blocks of old paint, in preparation for the new color and coat. There were 5 of us on task painting. We completed the project without totally messing up the kitchen which was confining, especially for 5 people. 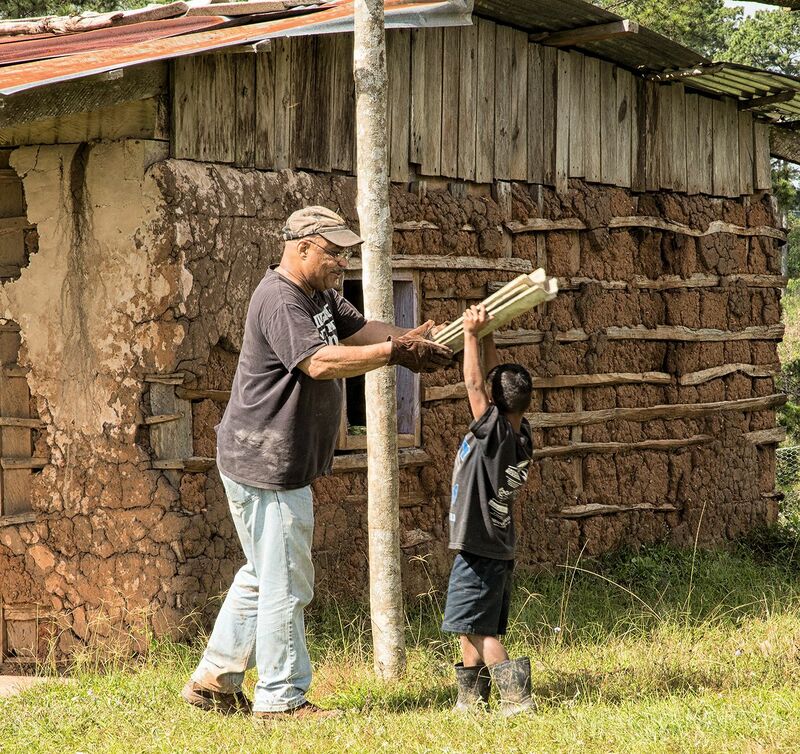 .Some of the team went to El Choro to build an oven for an abode and do work on floors. The rest of us were finishing up the school. We are headed to Carrizal for a mission that will keep the team here for a day or two. I offered to walk, as we would be taking the short cut. I was not ready for what I envision as the Honduras Death March. Being at altitude and terrain whose grades were extreme, to me, exhausted me. The others seemed OK, but then they have been here before. I garnered an even greater appreciation and respect for the kids, not the mention adults, who traverse this terrain…effortlessly. At last, I arrived at the destination (everyone else was already there) . I was encouraged, as my Spanish gradually began to surface with the people to whom I was just introduced. The connection was wonderful. I was making linguistic headway with the family outside their dwelling, with neighbors and family members. I admit to being caught up in the excitement of developing a rapport with the people using language. Enough chatting, where is everybody? This location was by far the most intensive work yet. The locals were mudding a school house wall with cement and we were hiking to one of two locations where a house was going to be framed. All the wood needed to complete the project is cut with a Machete. The tree, de-barking, poles rafters…everything. Oh yes, it has to be carried from point of acquisition to point of use. Everything that is wood. Inspiration as the day progressed was fueled by the fact that the family we were digging holes for support and measurement (eyeball), lived in a very small abode. Two adults and five little children resided here. The inside of the house was humbling, to me. This is why I am here! The Mission! And as an active participant, Not observer..Empowering! We completed the framing and then another hike, in the opposite direction up a small mountain to the next task. The hike is laborious and working in the rain did not help. But, all 7 of us persisted. Upon completing framing that house we returned to the school house which doubled as our hotel/gear storage facility. Working with senior members of the community, we left the school house base and proceeded to another location that the elders determined to be a priority. More mountains to climb. My body aches from the damp, sleeping on cold floors and cool damp nights. Blood sugar is vacillating more than the Dow Jones Industrial on a bad day. Personally, I cannot recall how many times I told myself to endure because nothing you are used to is here. Survival and endurance thoughts were on full alert. Way out of the comfort zone. Alone! Introspectively, the driving thought is this is not about me. I gave thanks with some prayers and surprised myself with what I learned. This is what mission encompasses. Selflessness!. The ride on an ox cart back to La Laguna was captivating. Cheno and Moreno (the lead and follow oxen respectively) kept me in awe of their power, as they effortlessly ascended the muddy road with its ditches and narrow turns. The driver was in command. There was a connection between him and is animals. The trip presented challenges the likes of which I have not experienced in a long time, if at all. The people provided me with both hope and appreciation of what it means to have, namely, family, community, humility, and above all appearance of being happy. I learned that material possessions are no substitute for that which promotes longevity. Hard work and lean frames abound in the mountain compared to the city of Yoro. Unfortunately the people are limited in their progressive education unless sponsored. The men are farmers and grow coffee and bananas. The women are child bearers and take charge of raising children. The decisional arm of the 12 villages is centered in Mataderos, where the tribal president resides There is no infrastructure here. Mobility is by foot, low cc motorbike, horse or oxen. The primary faith is Catholic and secondary is Evangelical. Schools go up to 6th grade. Higher requires an entirely different set of logistical and financial requirements. Medical is accomplished by the one women who serves as Consultoria. I want to note that this woman is performing an extraordinary service, for the 12 villages she serves given the extremely limited resources at her disposal. I am working on this also and will have goods to be taken on next trip. One young girl, Tonya, caught my attention while in Carrizal. Judy spent time teaching her and several other children UNO, a card game. Tonya was ever attentive to Judy’s effort to communicate, with her limited Spanish. Tonya’s eyes responded to instruction, body language and eye contact. And she picked up the game rather quickly. I also suspect the attention of these newcomers played a part. I watch and was impressed with Tonya and as such will be sponsoring her development, as best I can financially. I am grateful to have the resources enabling me to participate in this effort. This operation is what giving is about and I plan to do more while I am able.